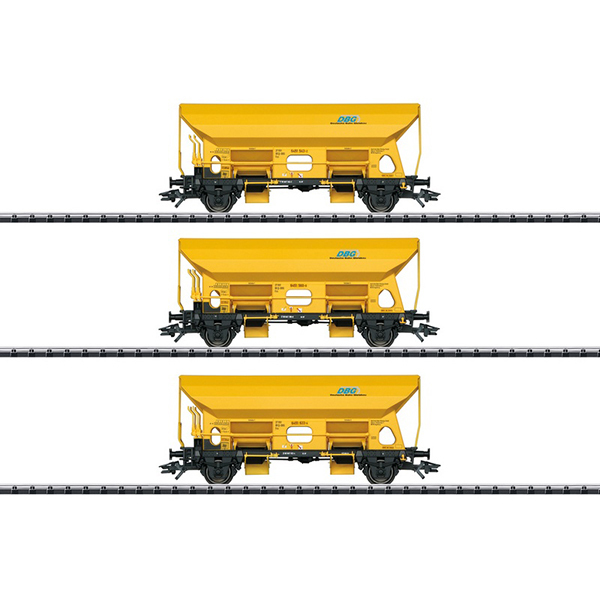 Prototype: Set of three (3) type Fcs side dump cars for Deutsche Bahn Gleisbau GmbH / German Railroad Track Construction, Inc., DBG. Plausible design that goes with the era. Model: The cars have intricate construction with many separately applied details. The chute extension on the cars is separately applied. Each car has an insert of ballast. All of the cars have different car numbers and each car is individually packaged. There is also a master package. Total length over the buffers 34 cm / 13-3/8". AC wheelset E700150. The locomotive to go with this car set can be found under item number 22402.